There’s no set formula for determining what gets reviewed here on The Headphone List, but requests and recommendations from our readers are always considered. I get a lot of suggestions for IEM reviews – so many that I have to keep a running list – but it is always my hope to incorporate those I feel have the most potential into the queue. In 2014, nothing has been requested as often and as vehemently as the VSonic VSD3S, Ostry KC06, and Havi B3 Pro I (maybe the Xiaomi Piston 2, but that’s already covered). The VSD3S is an obvious one, being VSonic’s first all-new release since the VSD1 and VSD1S models that I liked enough to include in the Earphone Buyer’s Guide. Ostry and Havi are two new(er) Chinese manufacturers that have been making quite a splash on Head-Fi. Since all three have similarly impressive performance and are priced around $60, it made sense to pit them against each other. All three turned out to be deserving of full reviews, which will be written up later on. Basics: I’ve had the KC06 the longest of the three. The earphone first impressed me with its packaging, which is a rather cleverly assembled without appearing wasteful. Accessories include 6 sets of single-flange eartips (three with a wide inner bore, and three with a narrow one) as well as a shirt clip, set of cable guides, and an (inconveniently small) velvet pouch. Cable noise is minimal, and though designed for cable-down wear, the KC06 can be worn cable-up with the right eartips. The cable is somewhat resistant to over-the-ear routing but a set of earhooks is included make this more convenient. Performance: The sound of the KC06 is on the whole balanced, but a little off-neutral. Bass is slightly enhanced overall, with mild sub-bass roll-off. Mids are quite forward, reminding me of the Fidue A63, though the KC06 is brighter and not as smooth. Thanks to strong upper midrange and treble presence, vocals are very intelligible. There is also plenty of sparkle, good top-end extension, and a soundstage that’s wide and airy. The strength of the KC06 is definitely its mids, which are prominent and very clear. The sparkly treble that nonetheless does not exaggerate harshness or sibilance is very good, too, and the presentation is nice and open for an in-ear earphone. The bass has good impact but not the best depth, which gives it a less solid thump than, for instance, the VSonic VSD3S with its plentiful sub-bass. Compared to many higher-end IEMs, the KC06 also sounds a little lean and lacks soundstage depth and imaging ability. For the price, though, it’s very hard to fault. 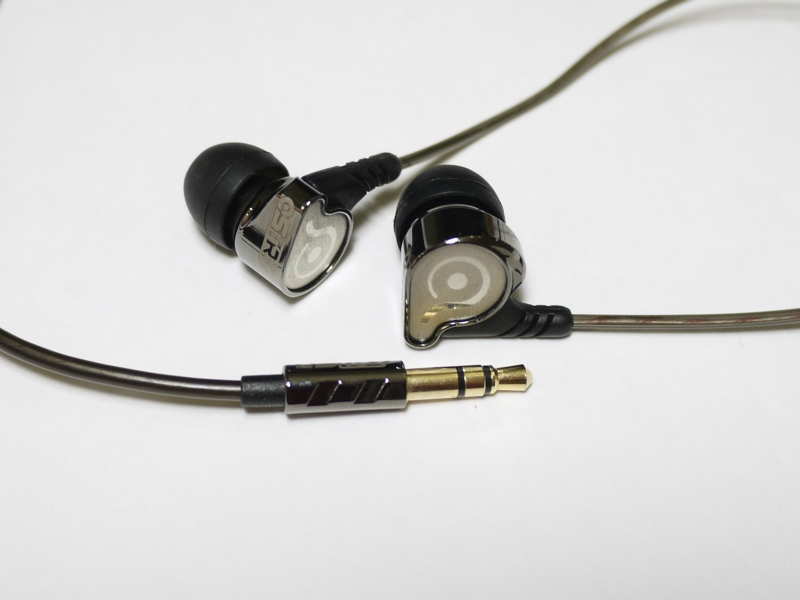 One peculiarity of the KC06 is that it is an extremely sensitive earphone. This was likely done on purpose – after all, the ability to reach ear-splitting volumes with ease is definitely a plus when competing in the consumer market. However, this also means that static will be audible with sources that have a high noise floor, so those who are hiss-sensitive may be better off with a less efficient earphone. In addition, low volumes can be hard to dial in with some sources. To start off, I compared the KC06 not only to the B3 Pro I and VSD3S, but also a few of my long-term benchmarks to see where it stands. The most striking thing about comparing the KC06 to the B3 Pro I is the difference in efficiency – the KC06 is significantly more sensitive than the average in-ear whereas the B3 – significantly less so. Combined, this creates an enormous difference in the general listening experience, with the KC06 reaching high volumes effortlessly and exposing hiss and background noise in the process and the B3 requiring a lot more juice to reach listening volume. Other than that, the B3 Pro I has quite a few similarities to the KC06 – punchy bass, clean and prominent mids, and present – but not excessively sharp or edgy – treble. The KC06 sounds more colored – its midbass hump is more audible, and yet overall it is brighter. The B3 has tighter, less pronounced bass and generally sounds more lean and dry. It is also darker, with less sparkly and extended treble, though the two earphones are equally smooth overall. The extra upper treble helps the KC06 seem a little more airy and out-of-the-head, but the B3 has the more well-rounded presentation. The VSD3S fits right in between the VSD1S and the pricier GR07 Classic in VSonic’s lineup, and the KC06 likewise sounds better than the VSD1S but doesn’t quite stack up to the GR07. The most obvious difference between the slightly v-shaped VSD3S and the KC06 is the midrange presentation – there, the KC06 sounds stronger and clearer thanks to its more forward midrange and brighter overall sound. The KC06 has more of a mid-bass hump and some deep bass roll-off, whereas the VSD3S has a better bass depth and feels more solid and natural at the low end. Tonally, the VSD3S is a little warmer. Interestingly, while the KC06 is brighter and a little more sparkly, it is still less sibilance-prone than the VSD3S. The HiFiMan RE-400 is a very balanced earphone with a mild midrange focus. Next to the KC06, it sounds a little dull, but also more accurate and neutral. Whereas the RE-400 is slightly flatter, tighter, and more extended at the low end, the KC06 has an audible mibass hump, though far from severe enough to really compromise bass quality. Both earphones have similarly forward mids, but the KC06 is brighter, which makes it sound even clearer and gives its vocals better intelligibility. The top end of the KC06 has more sparkle, but also tends to be less forgiving than the ultra-smooth RE-400. Overall, I found the KC06 to be a little colored-sounding next to the RE-400 but otherwise not far behind, especially considering the price gap. The Ultimate Ears 600 is a balanced armature earphone with a smooth, mid-centric sound signature not too different from that of the RE-400. In short, the UE600 is flatter and more neutral overall compared to the KC06, with less impactful – albeit more extended – bass. The Ostry is more colored-sounding, with brighter treble and more mid-bass boost. The UE600 sounds more full-bodied and natural in the midrange and has smoother treble. Basics: It’s quite rare for an IEM manufacturer to score so many hits in a row, but VSonic has had at least one solid release every year since the 2010 launch of the GR07. 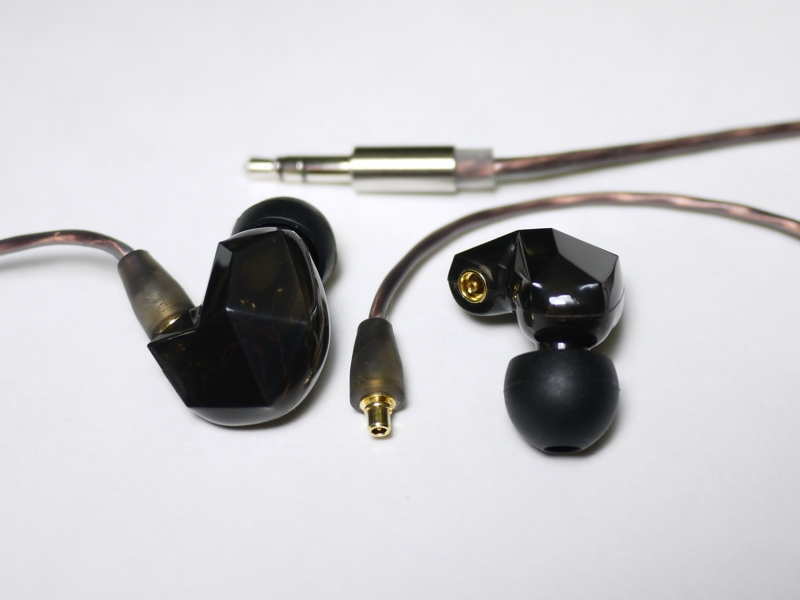 The first of VSonic’s new VSD series of in-ears, the VSD1S, has also spent a year and counting as one of the top picks in my IEM Buyer’s Guide. VSonic earphones have always had functional if somewhat plain packaging, and the VSD3S is no exception. Accessories are remarkably similar to those of the Ostry KC06, down to the sub-par carrying pouch. The VSD3S comes with 4 pairs of silicone eartips (including one double-flange pair), 1 set of foam tips, a pair of cable guides, and the drawstring pouch. The construction of the VSD3S is plastic, with rather handsome semi-translucent angular housings. The design is ergonomic, intended for over-the-ear wear, and similar in footprint to current-gen Westone earphones. The VSD3S foregoes the rotating nozzles of preceding GR04, GR06, GR07, and VSD1S in favor of a conventional fixed-nozzle design. Despite this, I found the earphones very comfortable and flush fitting. The new nozzles also keep tips in place better. A major selling point of the VSD3S is the detachable cable, a feature rarely found on sub-$100 earphones. VSonic has tried this once before with the VC02 model, but the connectors on it weren’t particularly secure. Combined with a lack of availability of replacement cables, this made the feature more trouble than it was worth. Unfortunately VSonic chose a proprietary coaxial connector for the VSD3S rather than a standard 2-pin or MMCX plug, but at least the new connectors are secure. There have been some reports of malfunctioning connectors but this is supposed to be fixed at this point and replacement cables – the key to the success of any detachable-cable earphone – seem to be available. As with the other over-the-ear VSonic models, cable noise is virtually nonexistent and noise isolation is pretty good – about on-par with the GR07. Performance: The sound of the VSD3S is typical VSonic all the way through, falling smack in the middle between the VSD1S, which is bassier and more v-shaped, and the new GR07 Classic, which is flatter and more refined. The bass is slightly enhanced, but still tight and accurate enough to compete with almost anything in the price range. The VSD3S has a very good balance of midbass and subbass – its deep bass, for instance, is more robust and extended compared to the Ostry KC06 and Havi B3 Pro I. Midbass is less prominent than that of the VSD1S and KC06, though still a little more emphasized and less tight compared to the GR07. Tonally, the VSD3S is similar to other VSonics – a bit warm thanks to the mild bass enhancement, but still quite close to neutral. It also maintains the mildly v-shaped sound of the GR07 and others, with less forward mids compared to the KC06 and Havi B3 Pro I. Treble is strong, providing good energy and crispness. As usual, it sounds very natural with the exception of a bit of sibilance, especially at high volumes. The presentation is quite good for in-ear in this price range, but lacks some depth compared to higher-end sets and misses out on some of the sheer expanse of the clearer, flatter GR07. The VSD3S has an advantage in efficiency over the B3, though not nearly to the same extent as the KC06. Its sound is more v-shaped overall, making the B3 Pro seem mid-centric in comparison. The VSD3S has more bass, especially deep bass, whereas the B3 misses out on the rumble and more solid “thump” of the VSonic unit. In the midrange, the B3 has more presence but also sounds a little thinner. The more forward mids make vocals sound more intelligible compared to the slightly more mid-recessed VSonic. The VSD3S has stronger treble presence but also sounds more sibilant next to the fairly smooth Havi. Overall, the single-driver VSonic set appears to have better bandwidth, and while the B3 has a nicely open and spacious sound with good imaging, it can’t quite match the dynamics of the VSD3S. The “lower-end” VSD1S is pretty much the same price at the VSD3S at the time of this writing, but aside from a little more bass doesn’t have much going for it in this comparison. The VSD3S is clearer overall and tighter at the low end, with less of a midbass hump and more focus on deep bass. The midrange of the VSD1S is a little more recessed, making it slightly muddier and more muffled than the VSD3S. The VSD3S sounds a little fuller, more neutral, and more natural as a result. Outside of the bass and midrange, these two don’t differ much, but the tighter bass and superior mids of the VSD3S are quite convincing. The GR07 Classic is to the VSD3S what the VSD3S is to the VSD1S. Both provide that quintessential VSonic signature but the GR07 boasts a clearer, more neutral sound with tighter bass. Bass quantity lags behind the VSD3S, but the GR07 Classic has less midbass and simply more refined lows overall. The midrange of the VSD3S is a little muddier and more muffled, whereas the GR07 sounds more natural. Ultimate Ears’ BA-based UE600 sounds a little mid-focused overall, making it an interesting contrast to the VSD3S. The VSonic unit is more v-shaped and has significantly more bass (and better deep bass) than the UE600. The midrange of the VSD3S is a lot less forward, and less clear as well. The UE600 sounds very mid-centric in comparison and has much smoother treble. The VSD3S is more sibilant but also has a more natural and dynamic presentation. The forward mids of the UE600 make it sound a little flat in comparison, keeping the soundstage quite forward and not very deep. Basics: The B3 Pro I from Havi has the appearance of a more pro-oriented product compared to the Ostry and VSonic units, from the rugged-looking cable down to the way it is packaged. 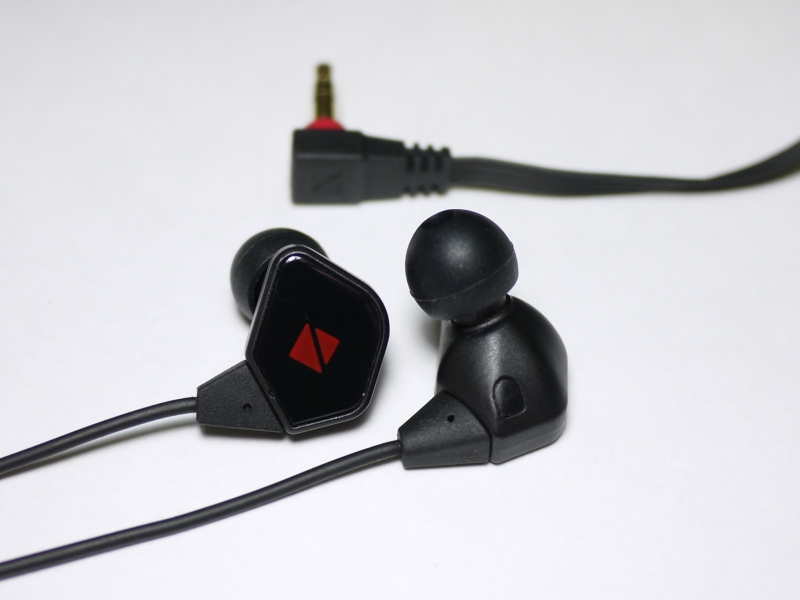 There are two stages to the earphone’s accessory kit – accessories found inside the acrylic box with the earphones, and those that Havi includes on the side. I’m not surprised that Havi had to add more accessories because all you get in the box are 3 pairs of single-flange silicone tips – slim pickings for a $60+ IEM. The additional accessories that shipped on the side include 3 sizes of double-flange tips, 3 more pairs of single-flange eartips in a different style, and a pair of foam tips, as well as a cleaning cloth, soft pouch, and clamshell carrying case. The B3 uses an over-the-ear design with a plastic build. The faceplates of the earphones are flat and oddly-shaped but the part that goes in the ear is quite ergonomic, making the B3 Pro I just as comfortable as the VSD3S. The nozzles are properly angled and while there are no cable guides included, there is a cable cinch to help fix the cord in place. The cord itself seems pretty standard – a little stiff and probably somewhat microphonic if not for the cable-up wear style. Below the y-split, the cable is flat, made up of the four leads placed side by side. The blocky 3.5mm L-plug seems quite durable, yet still works with most smartphone cases. Isolation is about on-par with the VSD3S – certainly decent enough for a dynamic-driver set. Performance: While the Ostry KC06 and VSonic VSD3S are both single-driver designs, the B3 Pro I utilizes a pair of 6mm dynamic drivers in each earpiece. You would expect plenty of bandwidth and a warmer, more bass-heavy sound, but the B3 is surprisingly lean and no less focused on its midrange than the Ostry KC06. It’s also quite inefficient – most so than any earphone I compared it to – and can be underpowered. The difference is not quite night and day, but a proper amp or source (I used a full-size OPPO HA-1 amp/DAC in my comparisons to make sure the B3 Pro was getting enough power) will bring out a fuller, less treble-tilted sound with more effortless imaging. With a poor source, the B3 Pro I tends to sound brighter and more compressed, both in soundstage and dynamics. The HiFiMan RE-400 provides a flatter and more balanced sound than even a well-amped Havi B3 but suffers from a slightly more forward, less out-of-the-head soundstage. It boasts slightly better bass depth and a thicker, fuller sound but still has a cleaner, sharper note presentation. Overall, I think the RE-400 is a hair clearer, but the Havi is thinner, more forward in the midrange, and slightly brighter thanks to greater upper midrange and lower treble presence. This often makes vocals seem more intelligible, which is impressive considering the RE-400’s reputation for clarity and vocal performance. The RE-400 is smoother through the treble but the Havi, surprisingly, does not seem prone to harshness or sibilance. The B3 is more spacious overall. One of the big drawbacks of the Flux as a consumer-grade earphone is its low sensitivity, but the Havi definitely has it beat there, requiring even more power to reach listening volumes. The overall signature of the Flux is balanced, with a bit of added bass and very mild midrange recession. Its bass is noticeably deeper than that of the B3 Pro I. The mids of the Flux are less forward, making vocals sound a little more muffled compared to the Havi unit. The Flux is a little more full-bodied and smoother through the treble, making it a bit more forgiving of treble artifacts. However, I still found myself preferring the brighter and clearer B3 most of the time. Seeing such capable and well-designed earphones coming from relatively little-known brands (plus VSonic, of course) is a testament to the market moving in a more competitive (and more value-driven) direction still, as it has been for the past couple of years. Testing three earphones head to head is never a simple task, and the excellent performance of these three didn’t make it any easier. Despite its lowest as-tested price, I personally preferred the sound of the VSD3S. Two things sealed the deal – the awesome bass and it being pretty much straight step forward from the VSD1S, which has been one of my sub-$50 benchmarks all year. The Ostry and Havi are extremely close to the VSD3S and each other in capability and value but the more extended and lively treble is where the KC06 (barely) won me over, though I liked the tighter bass and better imaging of the B3 Pro I. All three also had downsides, albeit ones totally forgivable for the price – the VSonic unit suffers from occasional sibilance and less forward mids; the B3 Pro I requires power and has a slightly thin note presentation; and the KC06 could use better depth and imaging. Look for full reviews of all three units in the months ahead! i have been reading your work for the past few months and i must say i am amazed at the time and effort you put in. bundle of thanks for this amazing work. i am using LG G6 with ESS Sabre DAC for portable music listening. i own two iems Mi Pro HD (triple Driver) and Fiio F5 to use with LG. as per my own experience LG has non existent bass and slightly peaky treble. Fiio F5 despite being warm and smooth produces a nice full bodied sound with LG. Mi Triple sound a bit hollow and thin with LG. i am planning to upgrade from Fiio F5. i am currently looking in to these models to use with my LG. Hi Joker, I got the Havi B3 Pro I (helped by your recommendation!) a while ago and liked it a lot. Now that it’s died, I’m thinking if I should get another pair or look around for something else. Are there similar earphones around the same price level that you would recommend? Primary concern would be sound signature, and cable durability to a lesser extent. At the moment the ones I’m most curious about are Fidue A65 (slightly worried that the wide barrel might not fit) and SoundMagic E80, though not sure if you have tried the latter. The A65 is more on the warm and smooth side compared to the Havi, so coming from the B3 it might leave you a little wanting in terms of clarity and detail, which the Havi does quite well. Unless you found the B3 lacking in some specific area, I’d only move towards a more balanced and resolving sound – otherwise it’s safer to just stick with the Havi. Something like a Final Audio Heaven II would be a bit of an upgrade in resolution, etc – it’s a flatter earphone and one of the best ones I’ve tried under $100. Not sure about the E80 – I’ve only tried it briefly and didn’t get a good read on the sound signature. Thanks. I looked up Fidue A65’s frequency response graph and you’re right, it doesn’t seem to be what I’m aiming for. I’ve decided to be adventurous and go with the SoundMagic instead for the mic (E80S/E80C) – because even if that doesn’t work out sound-wise, at least I’d have a decent headset I can use for calls. For future reference though, does the Final Audio Heaven II get harsh at all? There aren’t many detailed reviews but it looks promising in terms of compatibility with my preference. Curious if you think the Soundmagics are an upgrade to the Havi after you’ve spent some time with them. The Heaven II is a little edgy in the treble compared to the B3, but more benign than, say, a VSonic or a DUNU DN-1000. It’s right where I want it for most listeners – those who aren’t overly sensitive to harshness, of course. There’s a similarly-priced BA earphone that generally sounds similar but gives up some of the treble energy of the Heaven II for smoothness and loses some clarity as a result, so I generally don’t recommend it as often. That’s the Phiaton MS100BA. Hm, I spent the weekend testing the SoundMagic E80 and can’t decide if I consider it an upgrade over the Havi B3. The two are similar enough that switching has been no problem at all, but the most obvious difference is that the E80 has more sub-bass, making bass thumps more noticeable/feelable. The rest is harder for me to properly compare because the audio on my old B3 set keeps cutting out. I think the E80 wins in terms of sounding more natural, but I can’t tell whether it’s technically superior. In general I’m happy with it – at this point I personally still prefer the Havi due to the aforementioned bass difference, however it’s only a minor preference. Thanks, sounds like the E80 is an interesting earphone! I’m sure many listeners wouldn’t mind something that sounds like the Havi but with more sub-bass, even if it compromises bass quality somewhat, but I’d probably be with you in preferring the B3. I’ve been listening to the A65 a bit lately and I do like it a lot, but I don’t think it has the razor-sharp bass definition that the B3 had either. A little too warm/mid-bassy. Just came across the headphone list website and am very happy to have done so. Unless I’ve missed it, I have not found any mention of the Advanced Model 3 which is supposedly a contender for “best buy” lists in the under $100 category. Do you have any thoughts on the Model 3? hi there, just got my vsd3s delivered. And my first impression is , THEY ARE GREATTTTT…. I was afraid about bass quantity, but they sound crystal clear with plenty of bass. Really happy with the purchase. I must say they are clear update from sony MH1c. Awesome, very glad you’re enjoying them! Apologies for the duplication. There was an error when I submitted my comment. So wasn’t sure if it was posted. I appreciate the review a lot! Just curious, have you heard the new update to the vsd3s? They improved the build quality and (based off of descriptions) I think they slightly improved the soundstage as well as made the mids slightly more forward (based on a combination of what they claim to have changed and what I speculate from reading reviews of the older vsd3s). I might be able to get my hands on an older pair of vsd3s’s in hopes to give them a short comparison. I find them comparable to the smoother and bassier Monster tributes if memory serves me well (my pair broke a couple years back). I think the vsd’s sound a little more analytical with a some of the bass energy being shifted to the treble here. Also, usually not a big believer in a/bing burning in but the bass on these seem to have tightened up a bit over time and the treble seems to have become slightly less sibilant. I have several VSD3s and VSD3S, but the newest ones I have are from when they dropped the detachable cable and made them all fixed. I haven’t tried any new ones since then.